PHOWN (PHOtos of Weaver Nests) is a citizen science monitoring project aimed at determining the distribution of colonies or nests of all weaver species globally, and studying the variation in their colony sizes. Counting weaver nests and taking photos allows tracking of changes in weaver breeding effort. This project provides an easy way of monitoring common weavers, while helping the conservation of threatened weavers. Download PHOWN flyer here. To take part, read here. There are lots of records in the PHOWN database but there are also gaps that you can help to fill! The closest weaver colony to you! And even if you have submitted it already, you can submit repeat records. There are several species with no PHOWN records - see list below. There are several countries (within the range of weavers) with no PHOWN records - see global map here and zoom in to a country to see its PHOWN records. 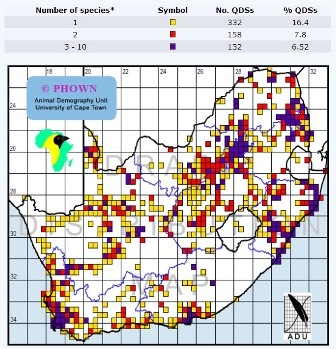 Click on the species number to see a species summary. Note: the nest of the following weaver species have not been described at all yet: Bates's Weaver, Golden-naped Weaver, and Yellow-legged Weaver (also the nest of the Forest Fody has not been formally described but is known to be similar to that of the Madagascar Fody). Clarke's Weaver - 2013 - news items. Black-chinned Weaver - 2013 - news items.